Protector of the Gate | Rollespræll! During the Dragon Wars several thousand years ago, Zarovich, the Keeper of Blood, built a secret lair for himself on the frozen plains of Niflheim. And to guard the entrace, he chose the Niflheim Giants. These giants were provided with 1.000 mighty axes, one for each family. And one member of every family dedicated himself to becoming a Protector of the Gate. Millennia later, the war was only a myth, Zarovich was long gone, and the giants had forgotten their duty until an adventuring party searching for the lair freed the giants from the Deathknight Lord Ragnar’s tyrannical rule. While not able to save the dying Niflheim Giant king, they managed to hear his dying words: “Zarovich Bako”. Not knowing what it meant beyonfd”Zarovich guides my hand”, they asked other giants about it. And it turned out to be the trigger word for the axes the giants used to carry with them, as well as activating their Protector of the Gate class. 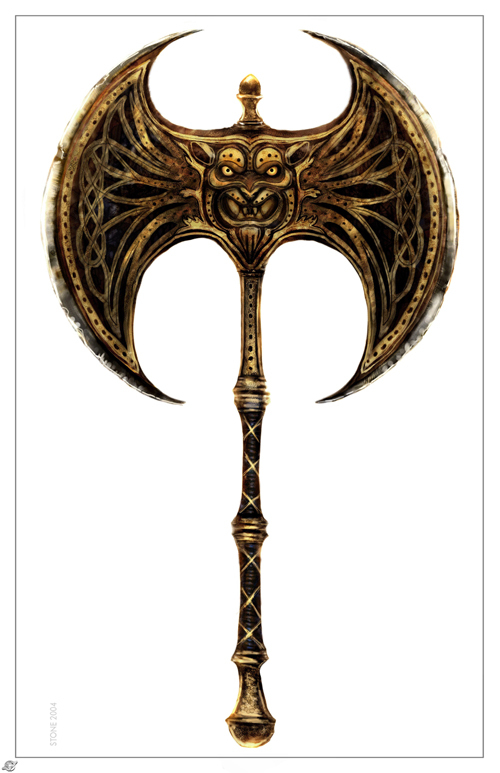 The Niflheim Axes are artifacts, 2-handed Huge axes and can only be wielded by Large or bigger creatures. In the hands of anyone except Niflheim giants, they act as +1 Axes, dealing 2d10+1 dmg/19-20X3.